"I have caught you and now you have to give me my prize," he said to the leprechaun. "Indeed I do! Indeed I do! 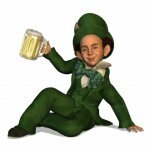 Fair's fair and rules are rules," the leprechaun giggled with mischief in his eyes. "Listen to my proposition and see what you think." "I am listening," said his captor. "Behind you is a cave. It is no ordinary cave, although it may appear so at first glance. And here I have a pair of gloves. They are no ordinary gloves. Here. Try them on!" The leprechaun handed the gloves to his captor. 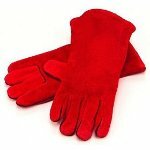 They looked like fairly ordinary gloves, made of red coloured leather and they fit rather well. He looked at the leprechaun with raised eyebrows, inviting him to explain further. "Do you believe that we know magic?" asked the leprechaun. "Would I have sought you otherwise?" his captor replied. "Good, good," said the leprechaun. "Then I will tell you. On your hands are the Gloves of Plenty. Come with me into the cave." He led the man into the cave. As soon as he crossed the threshold, his gloves turned palm downwards, the fingers curving like grasping claws. He tried to relax his arms and fingers but could not. "Don't be alarmed!" said the leprechaun. "These are magical gloves. I want you to think of something that you desire. You can only choose one thing at a time. Anything you like. When you have that thing in mind, reach forward with one of your gloves and imagine grabbing it." The man took a few moments to compose himself, then his eyes moved up and to the side as he began to form a clear picture in his imagination. After a few more seconds he reached forward with his right hand and as his fingers closed. To his astonishment he felt them grasp hold of something. 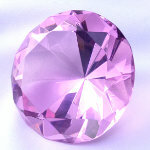 He brought his hand close to his face and looked at the object - a huge , flawless shimmering pink diamond. His eyes lit up! "Fantastic!" the man said. "Thank you. I will be on my way. You can consider your debt settled." "Not so fast," said the leprechaun. "If you leave now, the diamond and the gloves will disappear the moment you cross the cave threshold. You must stay here for 14 days. In that time you can use the gloves to create anything you want or need. At the end of 14 days, you will be free to take away as much as you can carry." "14 days!" said the man. "But I barely have provisions for another day. What will I eat?" The leprechaun smiled at him then turned his eyes to the gloves. "Anything that you need," he said. Once again the man took a few moments to focus and reached out with his right hand. The leprechaun sniffed appreciatively as a wonderfully prepared piece of venison appeared in the man's hand. The man took a bite, his eyes closing as he savoured the rich flavour. "Mmmmm. Fourteen days you say? Now I think I might just be able to manage that!" "Are you sure?" the leprechaun asked. "Once I leave you will be completely sealed in until I return at the end of the fourteenth day. Last chance to back out." The man took another big bite of the venison and then looked at the diamond which he had transferred to his left hand. Juices from the meat dripped down his chin as he grinned. "Are you kidding? See you in two weeks, shortie!" he laughed. "OK, then!" the leprechaun skipped out of the cave and as soon as he did so, a large boulder appeared, blocking the exit and the sunlight. The man quickly used one of the gloves to create four lanterns, which he placed around the edge of the cave to provide light. "As much as I can carry!" he thought to himself. "I am going to be rich beyond my wildest dreams, in fact beyond the wildest dreams of the World Wild Dream Champion." Realising he had plenty of time, he decided to first have himself a little banquet. He had been many days tracking the leprechaun and his rations had been spartan. Using the gloves he created for himself first a large table and some beautiful plates and cutlery, then he covered it with a feast of his favourite fine foods. When he had done this, he tried to create for himself a large jug of wine. To his surprise he was able to produce the jug, but it had no wine in it. He tried again, using the opposite hand, but once again he produced a very beautiful, but empty vessel. Then the man remembered what the leprechaun had said. He could only choose one thing at a time. Returning to his imagination, he created a mental picture of just the wine. Reaching out with the glove he saw the red liquid appear in the air. He tried to grasp it but could not. The liquid fell through his fingers, disappearing before it reached the ground. He scratched his head and tried again. This time he tried to hold one of the jugs underneath his grasping hand to catch the falling wine. But it was no use. The wine appeared to enter the jug but when he looked inside, it was empty, the wine had vanished. It seemed that things had to be grasped by the glove to fully materialise. The man felt his first pang of worry. Now he was facing 14 days without a drink. But his worry soon subsided as he used the glove to produce first a coconut, then several oranges and a big shiny melon. "Ha ha!" he laughed to himself. Thirst was not going to be a problem now. After consuming as much of the feast as he could manage, he began to feel sleepy. He used the gloves to create several sheepskins which he laid out on the floor of the cave creating a soft, warm comfortable bed for himself. He settled down for some sleep, deciding to start creating more wonderful treasure for himself in the morning. When he awoke in the morning, the man was feeling rather strange. His head was fuzzy and he noticed that his skin seemed to be a little flushed. But after taking in his surroundings and satisfying himself that the tremendous fortune of the day before had not been a dream, he put these things to the back of his mind and began to ponder what he might create with the gloves today. The leprechaun had said he could take out of the cave all he could carry. Did he mean carry on his own or could he create a horse and cart? He did not know. But why not try it? He could always create himself a big backpack as well and find out when the leprechaun arrived. Could the gloves create such big things? Liquid did not work because he could not grasp it. He could grasp onto the mane of a horse or the side of a cart, but did that count? There was only one way to find out. 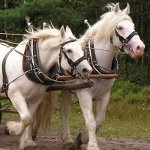 A few minutes later he was once again laughing as a large four-wheeled cart and two magnificent pack horses stood before him. "Plenty of time left," he thought to himself as he stroked one of the horses manes and materialised a couple of juicy carrots for it. Soon afterwards, the other horse lifted its tail and expelled a steaming pile of manure onto the floor. "Oh, no!" he thought. "I really must start thinking these things through!" No doubt there would be plenty more where that came from over the next thirteen days, quite an unpleasant thought in an enclosed space! "A lesson learned," he thought, then he proceeded to create an enormous backpack in case the magic did not allow him to use the cart. After putting his pink diamond into the backpack, he proceeded to create more and more precious jewels, delighting at their flawless brilliance and myriad colours. Every once in a while he stopped to try on the backpack and make sure he could still carry its weight. Eventually he knew he was close to his limit. Enough was enough. Selling that amount of jewels would bring him 1,000 times more money than he could earn in a lifetime and then some more. There was still room in the backpack but he decided to stop there. It was then that he realised that he had no idea what the time was and no way of finding out. With no light entering the cave, he could not even tell whether it was day or night. But he found himself feeling sleepy once more so he decided to take a nap. He was awoken by a blinding headache. He felt muscles in his legs twitching involuntarily. Feeling tired and weak he raised himself up and looked over at the horses who were both laid down on the ground. One raised his head and looked at him momentarily before laying it back down again. Their breathing seemed heavy and laboured and then he noticed that he too was struggling for breath. He tried to think what might be happening, but concentration was so very hard. He felt a kind of intoxication, as if his brain was not functioning correctly. Then he seemed to hear a voice. He could not tell if the leprechaun was there or whether he was remembering. "....completely sealed in..." said the voice, ".... completely sealed in ...."
With difficulty he made his way over to the boulder which covered the cave entrance. He felt his way around its edge with his hand. His heart sank and he fell to his knees. Completely sealed in. 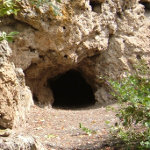 Thirteen days later a whistling leprechaun arrived at the cave entrance. With a little blow on his tin whistle, he made the boulder disappear. "Ha ha! Horses! What an eedjit!" he laughed to himself out loud. "This one won't have lasted long. I could have come back a week ago!" Standing at the cave entrance he clicked his fingers. The Gloves of Plenty appeared in his hand. Then holding his nose to keep out the stench, he strode over to the backpack and dragged it out of the cave. He blew on his whistle again and three leprechaun friends appeared as if from nowhere. "Fill your pockets, lads," he said with a giggle in his voice. They took his advice and then off all four of them strode, singing as they did so. But real precious gifts cannot be grasped, Life gives us those for free. Until much too late they realise they've been taking life for granted."